Horse of the Year Show is delighted to announce that there will be an individual final for both New Forest and Connemara ponies during the Mountain & Moorland Ridden Pony of the Year Championship at this year’s show, held at Birmingham’s NEC from 9th-13th October 2013. Since the introduction of Mountain & Moorland classes to the Horse of the Year Show schedule in 1999, the New Forest pony has competed against the Connemara at both the qualifying stage and the final. Following the announcement back in March that there will be eight stand-alone qualifiers for both breeds from 2013, in addition to a number of combined qualifiers, these individual finals will enable the two breeds to compete independently during the competition process. 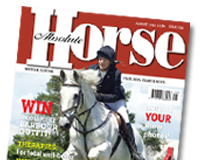 Having noticed a significant increase in the number of top-quality New Forest ponies coming forward to qualifiers and the increasing volume of Connemara entries at qualifiers, Grandstand Media Ltd, organiser of Horse of the Year Show, considered it a natural progression to have a greater number represented at HOYS.